Perhaps the most impressive thing about Elizabeth Moon's Vatta's War series, four books in, is how consistent it's been in stopping just short of blowing me away. All of the ingredients are here for great space opera: a likable underdog heroine who literally has to claw her way up from rock bottom; a convincing future with a well-defined mercantile culture; even a few exploding spaceships here and there. But if you've read my reviews of previous volumes, you'll know that what we get is just good space opera, a heavily intellectualized exercise that's impressively crafted but just doesn't grab you by the short n' curlies and yank. 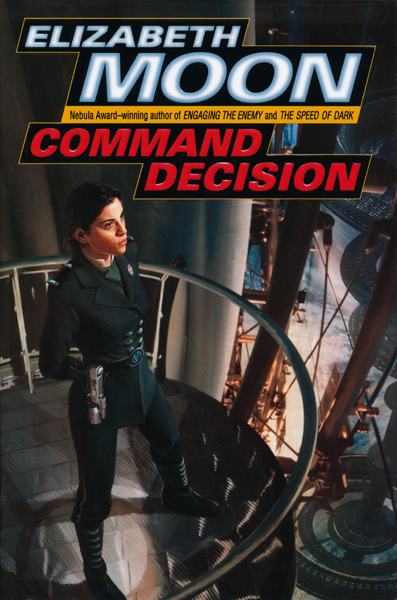 Command Decision is perhaps the best book of the series so far, though it suffers no less than the previous three for going heavy on the exposition. But its story is the most well-rounded of the bunch to date. More supporting characters are brought front and center, and we begin to get a feel for just how past tragic events have affected individuals on a deeply personal level. After a false start at the end of Engaging the Enemy, Ky Vatta now finds herself leading all of three ships in what she has archly named the Space Defense Force. It may not be exactly enough to face the impressive-sounding pirate fleets that have been taking over entire systems, but it's a start. As word spreads, she finds herself joined by an adventure-seeking, rich dilettante — not exactly the most promising ally in an actual shooting war, but someone with the pursestrings to solve a number of Vatta's financial problems. 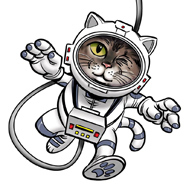 She also sees firsthand how the recent pirate activity, aided immeasurably by the shutdown of the ansible platforms that allow near-instant communication across light-years of space, has inspired local corruption. One trading station has gone completely rogue, charging visiting ships enormous docking fees, then attacking them and enslaving their crews. Back on various homeworlds, Ky's remaining family and friends are sorting out things on their ends. Rafe — no longer the studmuffinly rake on loan from a romance novel but an actual character of substance — finds serious trouble in river city when he tries to pay a call on his parents. His father — chairman of ISC, the company that runs the ansibles as an iron-fisted monopoly — mother and sister are all in deep trouble after a nasty bit of treachery within the company. Rafe's attempt to rescue them lends the series one of its best suspense sequences yet. You can tell that Moon, an ex-Marine, is drawing on a bit of personal expertise here. Elsewhere, Ky's cousin Stella and the orphan Toby, a whiz-kid with gadgets, are improving the shipboard ansibles whose existence is still largely a secret, with an eye towards securing a patent and blowing ISC's communications monopoly. Reuniting with the mercenaries who helped her deal with some unpleasant business in Marque and Reprisal, Ky gets into her first real scrap with the pirate fleets, while Rafe tries to forestall further disaster by undoing the damage of the corporate coup back home. The net result is the series' most sustained and entertaining volume yet. On the whole I'd still have to say that Vatta's War has not lived up to its fullest potential. Or perhaps I should say that, if it hasn't, it may be because Vatta's War has been marketed as guns-a-blazin' military SF, when it's actually a speculative look at economics in an interstellar age. Moon is more interested in considering how well, if at all, laissez-faire capitalism might function when people are separated by star systems, and there is no centralized governmental hub (like Star Trek's Federation) regulating anything. As the series' metastory makes clear, such an economic scenario will prove a fertile breeding ground for the worst sorts of crime and corruption imaginable, which means all you free-market loving libertarians out there are not exactly Moon's target audience. A bleak outlook, perhaps, but one delivered with a generally hopeful message about the benefits of cooperation and the laying down of basic, sensible ground rules. For the series finale, I'm hopeful Moon will finally draw the ideal balance between action and drama, and deliver the tight, thinking-fan's space opera I've been wanting all along. After all, this must be called Vatta's War for a reason. And I for one am ready for battle.